Nose: A little difficult to pin down; sweet forest undergrowth, tea loaf, smoked meats, and some slight smokey notes. Some light spice hints, and a faintly medicinal edge. Palate: Sweet and dry, a bit stiff and wooden; lots of oak spices, hints of orange and lemon peel, a bit of medicinal peat smoke hanging around as well. Not overly smooth, nor punch like many younger malts. Mouthfeel: Quite dry, and not very thick. Not really any oils to speak of. A decent burn – more than normal from a vatted blend, but it only lingers for a short while before dying off rapidly. Finish: Long and smokey with a decent amount of spice. On the rocks: A bit of ice washes the nose right out – now just leafy and grassy with the slightest medicinal traces. The palate is now quite oak heavy – its sweetness and fruit has disappeared. Full of oak spices with a medicinal edge. Still more burn than I was expecting. Adding ice to this whisky thickens the whisky somewhat, and makes it slightly creamy, and with much less burn than without ice. The finish is muted somewhat, but has the same characteristics as without ice – although now a fair bit shorter. This whisky is a limited release blend from Berry Bros & Rudd, current owners of The Glenrothes brand, and former owners of the Cutty Sark brand; and only 2391 bottles were produced. 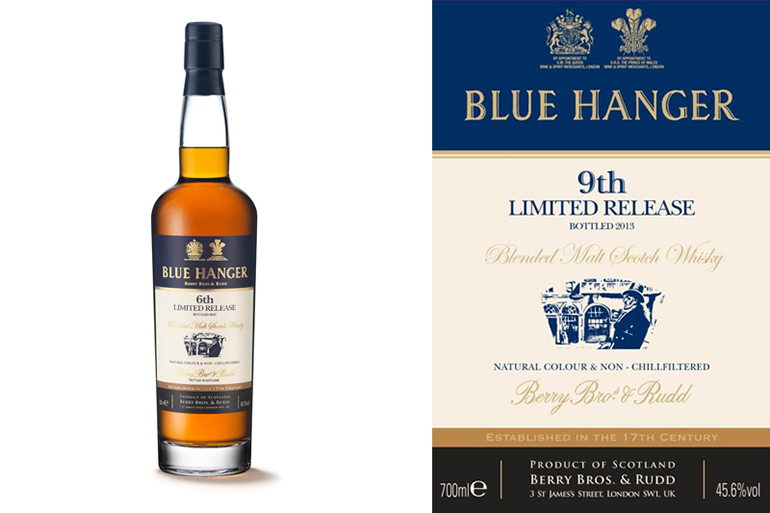 Blue Hangar 9 is a blend of 4 whiskies – 2 from Speyside, and 2 from Islay: a 17yo Clynelish, an 18yo Glen Elgin, a 33yo Bunnahabhain, and a 7yo Bunnahabhain. It is non-chill filtered with no added colouring, and bottled at 45.6% ABV. This, the 9th release, was bottled in 2013. Although I have heard some good things about most previous Blue Hangar releases (and have had one that I liked at a bar a while ago, but cannot remember which release it was), I cannot say that I am overly enamoured with the 9th release. It’s quite a stiff and wooden spirit, almost exactly what you’d expect a humourless septuagenarian ex-navy officer dressed in a grey pin-striped suit with razor-sharp creases sitting in an over-stuffed and excessively elaborate lounge-chair to be drinking on a grey, stormy and windy evening in a big and drafty old house.